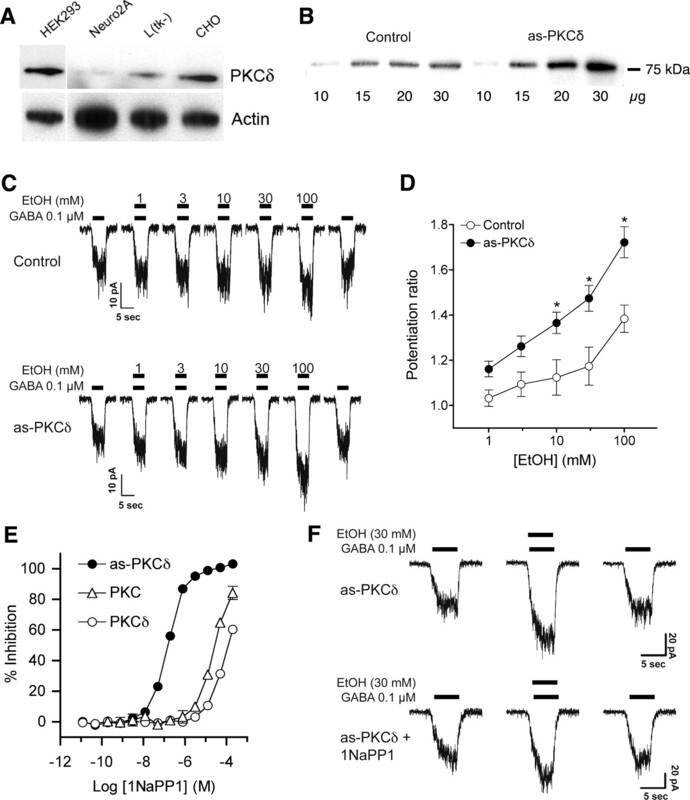 Ethanol alters the distribution and abundance of PKCδ in neural cell lines. Here we investigated whether PKCδ also regulates behavioral responses to ethanol. PKCδ−/− mice showed reduced intoxication when administered ethanol and reduced ataxia when administered the nonselective GABAA receptor agonists pentobarbital and pregnanolone. However, their response to flunitrazepam was not altered, suggesting that PKCδ regulates benzodiazepine-insensitive GABAA receptors, most of which contain δ subunits and mediate tonic inhibitory currents in neurons. Indeed, the distribution of PKCδ overlapped with GABAA δ subunits in thalamus and hippocampus, and ethanol failed to enhance tonic GABA currents in PKCδ−/− thalamic and hippocampal neurons. Moreover, using an ATP analog-sensitive PKCδ mutant in mouse L(tk−) fibroblasts that express α4β3δ GABAA receptors, we found that ethanol enhancement of GABA currents was PKCδ-dependent. Thus, PKCδ enhances ethanol intoxication partly through regulation of GABAA receptors that contain δ subunits and mediate tonic inhibitory currents. These findings indicate that PKCδ contributes to a high level of behavioral response to ethanol, which is negatively associated with risk of developing an alcohol use disorder in humans. GABAA receptors are the main inhibitory neurotransmitter receptors in the brain and are a major target for sedative-hypnotic drugs, including ethanol (Mehta and Ticku, 1999). Although ethanol can enhance the function of GABAA receptors, the importance of this effect for mediating behavioral responses to ethanol in addition to anesthesia has remained controversial (Criswell and Breese, 2005; Weiner and Valenzuela, 2006). Recently, several laboratories have reported that mild to moderately intoxicating concentrations of ethanol (3–30 mm) enhance tonic GABA currents in neurons (Wei et al., 2004; Fleming et al., 2007; Liang et al., 2008) and in heterologous systems expressing α4βδ receptors (Sundstrom-Poromaa et al., 2002; Wallner et al., 2003), which form extrasynaptic GABAA receptors that mediate tonic inhibitory currents in neurons (Glykys and Mody, 2007). 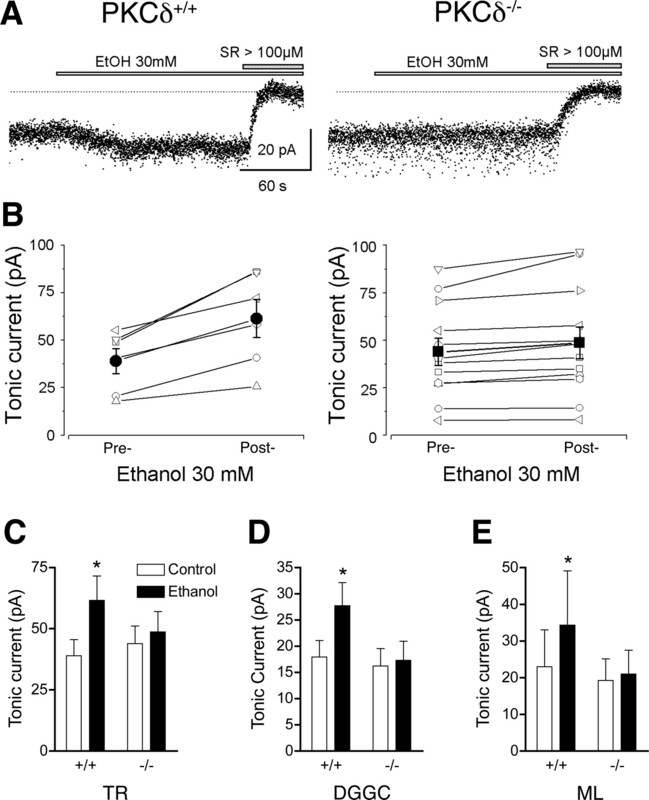 These results suggest that enhancement of tonic GABA currents contributes to pharmacological effects of ethanol observed during social drinking. However, this conclusion has been challenged by recent studies that could not replicate these findings (Borghese et al., 2006; Yamashita et al., 2006). The basis for this discrepancy is not known. Recently, we found that phosphorylation plays a critical role in altering the sensitivity of synaptic GABAA receptors to ethanol. Synaptic receptors mediate phasic inhibitory currents in neurons, and instead of δ subunits, contain γ2 subunits, which target the receptors to the synapse (Glykys and Mody, 2007). Using receptors comprised of α1β2γ2 subunits, we found that protein kinase C (PKC) ε-mediated phosphorylation of γ2 subunits reduces ethanol enhancement of receptor function (Qi et al., 2007). This finding raised the possibility that phosphorylation also regulates GABA-stimulated tonic currents carried by receptors containing δ subunits. Previous studies using gene-targeted mice have demonstrated that two members of the protein kinase C (PKC) family, PKCγ and PKCε, reciprocally modulate behavioral responses to ethanol. Mice that lack PKCγ show reduced signs of ethanol intoxication and consume more ethanol than wild type mice (Harris et al., 1995; Bowers et al., 1999; Bowers and Wehner, 2001), whereas mice lacking PKCε show increased signs of ethanol intoxication (Hodge et al., 1999) and decreased ethanol self-administration (Hodge et al., 1999; Olive et al., 2000). In NG108–15 neuroblastoma-glioma cells, acute exposure to ethanol alters the subcellular localization of a third PKC isozyme, PKCδ (Gordon et al., 1997), and in PC12 cells, chronic ethanol exposure increases the abundance of this isozyme (Messing et al., 1991). These in vitro studies suggest that PKCδ is important for cellular responses to ethanol. It is not yet known, however, whether PKCδ regulates behavioral or cellular responses to ethanol in vivo. Here we investigated whether PKCδ is important for effects of ethanol on behavior and neuronal function using mice that lack PKCδ, which we generated by homologous recombination in embryonic stem cells (Chou et al., 2004). We report a series of behavioral, anatomical, pharmacological, and electrophysiological studies, that together show that PKCδ is required for full expression of ethanol intoxication and for ethanol enhancement of GABA-stimulated tonic inhibitory currents in neurons. PKCδ−/− mice were generated on a C57BL/6J × 129X1/SvJ background as described previously (Chou et al., 2004). Chimeric mice were bred with C57BL/6J mice to generate F1 hybrids, which were intercrossed to generate F2 hybrid (∼50% C57BL/6J and ∼50% 129X1/SvJ) littermates for experiments. Mice were housed in standard Plexiglas cages with rodent chow and water available ad libitum. The colony room was maintained on a 12 h light/dark cycle with lights on at 6:00 A.M. Only male mice were used for experiments when they reached ∼10 weeks of age. The Gallo Center Institutional Animal Care and Use Committee approved animal care and handling procedures in accord with NIH guidelines and Policies on the Use of Animals and Humans in Neuroscience Research as approved by the Society for Neuroscience. Ethanol-induced ataxia was evaluated using a mouse rotarod treadmill (Ugo Basile) set to a fixed speed of 20 rpm (Dar, 1997). Mice received an intraperitoneal injection of ethanol [20% (v/v) with isotonic saline], and then tested for latency to fall from the rotarod every 15 min over a 60 min period. The animals were used only once in this experiment. Ethanol-induced hypothermia was examined by measuring rectal temperature using a type J thermocouple (Barrant, Barrington, IL) at room temperature (22 ± 0.5°C) before and after an intraperitoneal injection of 4 g/kg ethanol (20% (v/v) with isotonic saline). Rectal temperature was assessed every 30 min up to 120 min after ethanol administration. The duration of the loss of righting reflex (LORR) and plasma ethanol clearance were examined as described (Choi et al., 2002). Other behavioral studies are described in the supplemental Methods available at www.jneurosci.org as supplemental material. Mice were anesthetized with pentobarbital (80 mg/kg) and perfused via the aorta with 4% paraformaldehyde (Sigma-Aldrich) in phosphate buffer (PB). Brains were removed and postfixed for 2–4 h in the same fixative at 4°C. For immunoperoxidase studies, brains were immersed in 30% sucrose for 24 h, frozen, and cut in 35 μm sections using a sliding microtome (Leica). Free-floating sections were incubated in 3% hydrogen peroxide in PBS for 10 min followed by 50% alcohol for 20 min, and then 10% normal donkey serum in PBS for 30 min, followed by primary goat polyclonal antibody recognizing the C terminus of rat PKCδ (1:1000–1500) (Santa Cruz Biotechnology) overnight. Sections were then incubated in 2% normal donkey serum in PBS for 10 min followed by biotinylated secondary donkey anti-goat antibody (1:300) (Jackson ImmunoResearch) for 2 h and then ExtrAvidin-peroxidase complex (1:3,000) (Sigma-Aldrich) for 2 h. Peroxidase was histochemically visualized with diaminobenzidine. Control experiments omitting primary antibody resulted in lack of immunostaining, and specificity of the primary antibody was confirmed by absence of immunoreactivity in brain sections from PKCδ−/− mice. Tonic and phasic inhibitory currents were recorded as previously described (Stell et al., 2003; Wei et al., 2004) in slices prepared from PKCδ−/− and PKCδ+/+ littermates (40- to 60-d-old). An examiner blinded to the genotype of the slice performed the recordings. The artificial CSF contained (in mm): 126 NaCl, 2.5 KCl, 2 CaCl2, 2 MgCl2, 1.25 NaH2PO4, 26 NaHCO3, 10–25 d-glucose, 0.005 GABA, and 3 kynurenic acid at a pH = 7.3–7.4 when bubbled with 95% O2/5% CO2. Whole-cell recordings were made from neurons identified by IR videomicroscopy (Versascope; E. Marton Electronics) using pipettes filled with (in mm) 125 CsCl, 5 NaCl, 2 MgCl2, 10 Hepes, 0.1 EGTA, 2 Na-ATP, 0.5 Na-GTP, and 5 QX-314 (pH: 7.25, 280–290 mOsm). The amount of tonic current was measured as described (Stell et al., 2003) by subtracting the current in the presence of saturating concentrations of SR 95531. IPSCs were detected and analyzed using LabVIEW-based software (National Instruments). PKCδ was expressed and purified as described previously (Allen et al., 2007). Kinase activity was measured by fluorescence polarization as described (Qi et al., 2007) using 4 ng of native PKCδ or 8 ng of as-PKCδ, 2.5 μm ATP, and 0.012–2.0 × 105 nm 1-naphtyl-4-amino-5-(4-methylphenyl)-7-(t-butyl)pyrazolo[3,4-d]pyrimidine (1NaPP1). Reaction mixtures were incubated for 90 min at 27°C. Whole-cell patch clamp recordings were made on L(tk−) cells that either stably express both as-PKCδ and α4β3δ GABAA receptors (see supplemental Methods available at www.jneurosci.org as supplemental material), or only α4β3δ GABAA receptors (Brown et al., 2002). Cells were plated on a 35 mm Petri dish, which was placed in a recording chamber on the stage of an IX71 Olympus inverted microscope. The recording electrodes were pulled from borosilicate glass capillary tubing (Garner Glass) using a micropipette puller (P-97) (Sutter Instruments). The resistances of the electrodes were 5–8 MΩ when filled with pipette solution containing (in mm): 145 N-methyl-d-glucamine (NMDG)-Cl, 1 MgCl2, 10 HEPES, and 4 Mg2+-ATP, 2 Na+-ATP (pH 7.3, adjusted with HCl). The external solution used to perfuse the cells continuously during the experiment contained (in mm): 145 NaCl, 3 KCl, 2 CaCl2, 1 MgCl2, 10 HEPES, 10 d-glucose, and 20 d-sucrose (pH 7.4, adjusted with NaOH). The procedures used to test GABA and ethanol sensitivity were similar to those previously described (Qi et al., 2007). To test the effect of inhibiting PKCδ on GABAA receptor function, cells were incubated with external solution containing 10 μm 1NaPP1 or vehicle (0.1% DMSO) for 30 min before stimulation with GABA. Cells were then voltage-clamped at −75 mV and the GABA dose–response relationship was determined in the presence or absence of 10 μm 1NaPP1. The response to ethanol was then assessed by coapplication of ethanol with an EC20 concentration of GABA using a Perfusion Fast-Step SF-77B system (Warner Instruments) driven by pClamp 9 software (Axon CNS-Molecular Devices). There was a 1-min washout period between each drug application. Whole-cell currents were recorded using an Axopatch 200B patch amplifier (Axon CNS-Molecular Devices), filtered at 2 kHz, and digitized at 5 kHz with a Digidata 1322A interface and pClamp 9 software. The serial resistance was monitored continuously during each experiment, and data from cells that showed a >30% change in resistance were discarded. All recordings were obtained at 27°C. Unless otherwise noted, results are expressed as mean ± SEM values for the indicated number of experiments. Data were examined by unpaired, two-tailed t tests, or ANOVA, and differences between means were considered significant when p < 0.05. ANOVA for repeated measures was used when testing for the effects of drugs pre and postethanol in slice electrophysiology experiments. Chi-square analysis was used to determine whether inheritance of the mutant allele deviated from a Medelian pattern and to detect a difference in survival between PKCδ−/− and PKCδ+/+ mice. Nonlinear regression analysis was used to determine IC50 values for kinase inhibition by 1NaPP1. PKCδ−/− mice displayed normal reproductive behavior. At weaning, 919 offspring of heterozygous breeding pairs showed a Mendelian pattern of inheritance with 258 (28.0%) PKCδ+/+, 443 (48.2%) PKCδ+/−, and 218 (23.7%) PKCδ−/− mice (χ2 = 2.247, df = 2, p = 0.325). The spontaneous mortality rates were similar for PKCδ−/− (1.83%) and PKCδ+/+ (1.16%) mice maintained for at least 6 weeks (χ2 = 0.003, p = 0.95). The brains of PKCδ−/− mice showed no gross anatomical abnormalities, evidence of abnormal neuronal migration, loss or overabundance of neurons, or gliosis (data not shown). Water consumption was similar among wild type and PKCδ−/− mice (supplemental Fig. 1A, available at www.jneurosci.org as supplemental material). Strength, locomotor activity, and coordination were also similar between the genotypes (supplemental Fig. 1B–F, available at www.jneurosci.org as supplemental material). Therefore baseline motor function was not altered by deletion of PKCδ. To study the role of PKCδ in the acute effects of intoxicating concentrations of ethanol, we examined ethanol-induced ataxia using a constant velocity rotarod (Rustay et al., 2003). PKCδ−/− mice remained on the rotarod much longer than wild type littermates when administered 1.5 or 2.0 g/kg ethanol (Fig. 1 A). Two-way, repeated measures ANOVA showed main effects of genotype (F (1,56) = 14.58, p = 0.002) and time (F (4,56) = 12.77, p < 0.001), and an interaction between these factors (F (4,56) = 9.92, p < 0.001) with 1.5 g/kg ethanol. Similarly, there were main effects of genotype (F (1,56) = 5.52, p < 0.034), and time (F (4,56) = 19.98, p < 0.001), and an interaction between these factors (F (4,56) = 3.47, p < 0.013) at 2.0 g/kg ethanol. Acute responses to ethanol in PKCδ−/− mice. A , Ethanol induced much more ataxia in PKCδ+/+ mice compared with PKCδ−/− mice (n = 8 for each genotype; *p < 0.05 compared with PKCδ+/+ mice at the same time by Tukey's tests). B , Ethanol-induced hypothermia was greater in PKCδ+/+ mice compared with PKCδ−/− mice (n = 8 for each genotype; *p < 0.05 compared with PKCδ+/+ mice at the same time by Tukey's tests). C , Blood ethanol clearance after administration of 4.0 g/kg ethanol was similar in both genotypes (n = 12 for each genotype). We next examined responses to higher, hypnotic doses of ethanol by measuring ethanol-induced hypothermia and ethanol-induced loss of the righting reflex (LORR). Basal body temperature was similar in PKCδ−/− (37.88 ± 0.17°C, n = 8) and PKCδ+/+ mice (37.44 ± 0.16°C, n = 8; p = 0.086). However, when administered 4.0 g/kg ethanol, PKCδ−/− mice developed less severe hypothermia than PKCδ+/+ mice (Fig. 1 B). Two-way, repeated measures ANOVA showed effects of genotype (F (1,56) = 19.68, p < 0.001) and time (F (4,56) = 66.62, p < 0.001), and an interaction between these factors (F (4,56) = 8.06, p < 0.001). The duration of the LORR was also reduced (p = 0.034) in PKCδ−/− mice (48.8 ± 5.8 min; n = 8) compared with PKCδ+/+ littermates (78.0 ± 11.3 min; n = 7) after acute administration of ethanol. Because differential absorption, distribution, or clearance of ethanol could contribute to altered acute responses, we measured blood ethanol concentrations 1–4 h after intraperitoneal injection of 4.0 g/kg ethanol. We found that blood ethanol concentrations did not differ between the genotypes during this time period (Fig. 1 C). Thus, absence of PKCδ diminishes the ataxic, hypothermic, and hypnotic effects of ethanol by altering the nervous system response to ethanol rather than by altering ethanol clearance. The resistance of PKCδ−/− mice to ethanol-induced ataxia led us to investigate whether PKCδ is expressed in brain regions that control motor function. To determine where in the brain PKCδ is expressed, we identified PKCδ immunoreactivity in brain sections from PKCδ+/+ mice (Fig. 2 A,C–I). We examined sections from PKCδ−/− mice to identify nonspecific immunoreactivity (Fig. 2 B). We found that PKCδ was most abundant in thalamic neurons (Fig. 2 A,C), including those of ventromedial, ventrolateral, and ventroanterior thalamic nuclei, which receive fibers from the cerebellum, pallidum, and substantia nigra, and send projections to the motor cortex (Paxinos, 1995). Strong PKCδ immunoreactivity was also found in thalamocortical fibers in layers I, IV, and VI of the neocortex (Fig. 2 A,D). In the cerebellum, PKCδ immunoreactivity was detected in fibers of inhibitory basket cells contacting Purkinje cells whereas Purkinje cells overall displayed low to medium levels of PKCδ immunoreactivity. Lower levels of PKCδ were present in pyramidal neurons, dentate granule cells, and molecular layer interneurons of the hippocampus (Fig. 2 F), in the central amygdala, and, to a lesser extent, the basolateral amygdala (Fig. 2 G). There were some areas of light PKCδ immunoreactivity in the caudate–putamen (Fig. 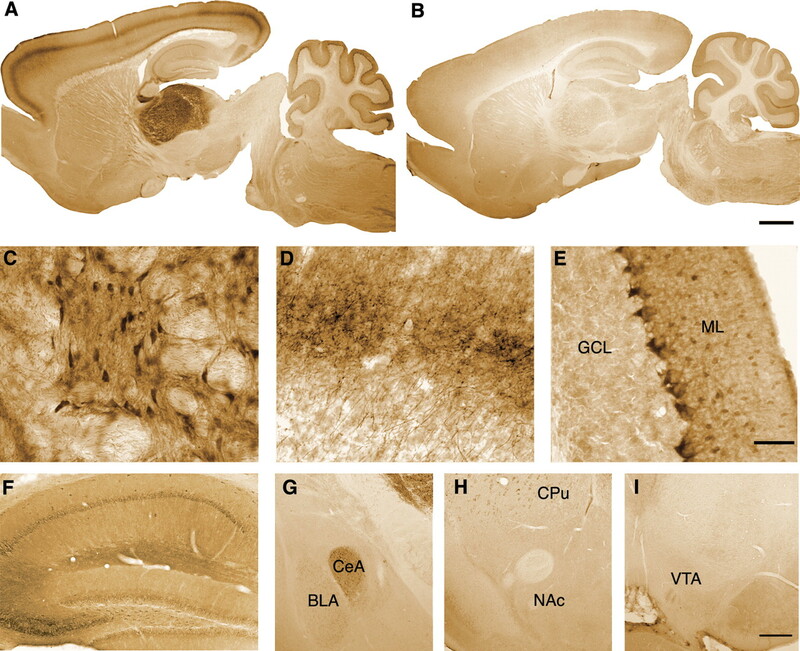 2 AA–H), but none in the nucleus accumbens (Fig. 2 H) or the ventral tegmental area (Fig. 2 I). Therefore, mouse PKCδ is mainly expressed in cerebellar and thalamocortical circuits, and to a lesser extent in the hippocampus and central amygdala. Expression of PKCδ in mouse brain. A , B , Immunoperoxidase staining for PKCδ immunoreactivity in sagittal brain sections from PKCδ+/+ ( A ) and PKCδ−/− ( B ) mice. C–E , High-power micrographs of ( C ) thalamus, ( D ) thalamocortical fibers in layer IV of cerebral cortex, and ( E ) cerebellar cortex from a PKCδ+/+ mouse. ML, Molecular layer; GCL, granule cell layer. F , G , PKCδ immunoreactivity was moderate in cell bodies of pyramidal neurons, dentate gyrus granule cells and molecular layer interneurons of the hippocampus ( F ), and in the central amygdala (CeA) ( G ). H , I , Scattered PKCδ immunoreactivity was observed in the caudate–putamen (CPu), but none was observed in the nucleus accumbens (NAc) or the ventral tegmental area (VTA). Scale bars: (in B ) A , B , 1 mm; (in E ) C–E , 50 μm; (in I ) F–I , 250 μm. To investigate molecular mechanisms that explain why ethanol-induced ataxia is reduced in PKCδ−/− mice, we used pharmacological agents to examine receptors previously implicated in ethanol-induced incoordination (Lüddens et al., 1990; Fidecka and Langwínski, 1995; Khanna et al., 1995; Grobin et al., 1998; Dar, 2002). We first tested pentobarbital and pregnanolone, which, depending on concentration, act as direct or allosteric agonists of most types of GABAA receptor. We found that, like ethanol, these drugs produced less ataxia in PKCδ−/− mice than in wild type littermates (Fig. 3 A,B). Two-way, repeated measures ANOVA showed an effect of genotype (F (1,56) = 7.04, p = 0. 019) and time (F (4,56) = 5.63, p = 0.007) without interaction between these factors (F (4,56) = 1.74, NS) for pentobarbital and an effect of genotype (F (1,56) = 5.76, p = 0.031) and time (F (4,56) = 13.68, p < 0.001) without an interaction between these factors (F (4,56) = 1.50, NS) for pregnanolone. Because pentobarbital and pregnanolone act at many different subtypes of GABAA receptors, we also examined the response to the classical benzodiazepine flunitrazepam, which acts as a positive allosteric modulator only at receptors containing γ2 subunits together with α1, α2, α3 or α5 subunits (Mehta and Ticku, 1999). In contrast to pentobarbital, pregnanolone and ethanol, 2 mg/kg flunitrazepam (Fig. 3 C) produced similar responses in both genotypes [F (1,120) (genotype) = 0.005, NS; F (4,120) (time) = 50.25, p < 0.0001; F (4,120) (genotype × time) = 0.249, NS]. This pattern of responses suggests that PKCδ regulates a subset of GABAA receptors that are not benzodiazepine-sensitive. A–E , Ataxia induced by drugs that act at GABAA and NMDA receptors. Mice were tested for their ability to remain for 3 min on a rotarod treadmill rotating at a constant velocity of 20 rpm before and after intraperitoneal injection of pentobarbital ( A ), pregnanolone ( B ), flunitrazepam ( C ), ketamine ( D ), or MK-801 ( E ). n = 8 ( A , B , D ) and n = 16 ( C ) for each genotype. In E , n = 7 for PKCδ+/+ and n = 8 for PKCδ−/− mice. Ethanol inhibition of NMDA receptors has also been implicated in ethanol-induced ataxia (Khanna et al., 1995; Dar, 2002). Therefore, we investigated whether PKCδ−/− mice show less ataxia in response to NMDA receptor antagonists. We found that the response to the noncompetitive NMDA receptor antagonist ketamine (50 mg/kg; Fig. 3 D) was similar in both genotypes [F (1,56) (genotype) = 0.895, NS; F (4,56) (time) = 63.97, p < 0.001; F (4,56) (genotype × time) = 2.47, NS]. Because ketamine also modulates GABAA receptors, we tested a second noncompetitive NMDA receptor antagonist, MK801 which does not alter GABAA receptor function (Hevers et al., 2008). Ataxia induced by MK-801 (0.5 mg/kg; Fig. 3 E), was also similar between the genotypes [F (1,52) (genotype) = 0.002, NS; F (4,52) (time) = 24.63, p < 0.001; F (4,52) (genotype × time) = 1.29, NS]. Because PKCδ−/− mice showed a diminished response to pentobarbital and pregnanolone, which act at most GABAA receptors, but not to the benzodiazepine flunitrazepam which acts at the majority of receptors that contain γ2 subunits, we postulated that PKCδ regulates GABAA receptors that lack γ2 subunits. The most abundant of these receptors are those that contain δ subunits, which combine mainly with α4 or α6 subunits to form receptors that mediate tonic inhibitory currents in neurons (Farrant and Nusser, 2005). Analysis of expression patterns for PKCδ in mice (Fig. 2) and for α4 and δ GABAA receptor subunits in the rat (Pirker et al., 2000) suggested that these proteins should overlap in the mouse thalamus and hippocampus. We confirmed this prediction by incubating sagittal brain sections with antibodies against PKCδ and α4 (Fig. 4 A) or δ (Fig. 4 B) GABAA receptor subunits. In contrast, in the cerebellum, PKCδ immunoreactivity was present in the molecular and Purkinje cell layers of the cortex and did not overlap with immunoreactivity to GABAA δ (Fig. 4 C) or GABAA α6 (data not shown) subunits, which were expressed instead in the granule cell layer. Colocalization of GABAA α4 and δ subunit immunoreactivity with PKCδ in mouse brain. A , Coronal sections through the hippocampus and thalamus showing immunoreactivity for PKCδ (red), α4 subunits (green), and their colocalization (yellow) in hippocampus and thalamus. B , Similar sections showing immunoreactivity for PKCδ (red), δ subunits (green), and their colocalization (yellow) in hippocampus and thalamus. C , Sections of cerebellar cortex showing PKCδ immunoreactivity in the Purkinje cell and molecular layers, which did not colocalize with δ subunit immunoreactivity present in the granule cell layer. Scale bars: A , B , 500 μm for low-power images, 50 μm for high-power images; C , 50 μm. 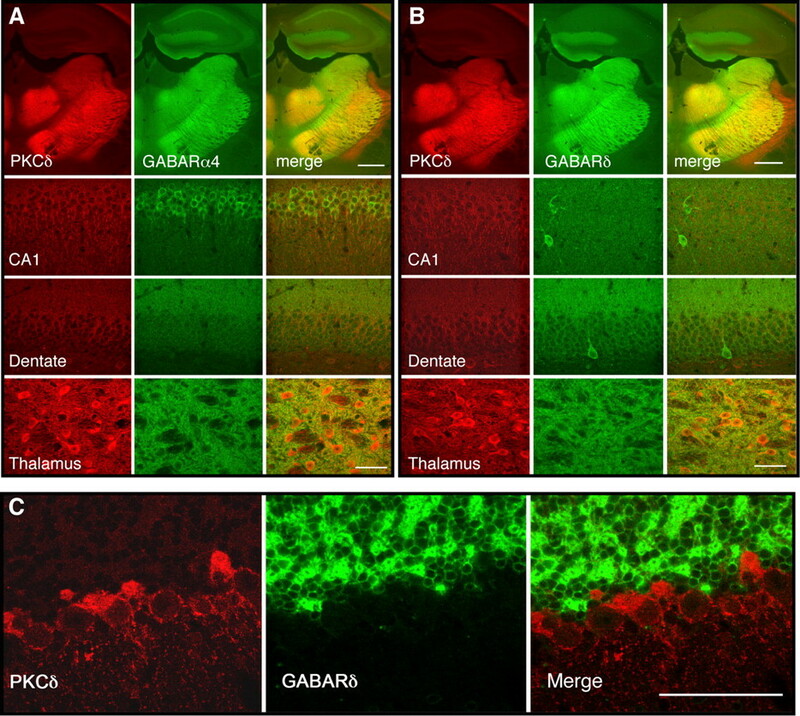 These histological findings raised the possibility that PKCδ regulates tonic GABA currents in brain regions that regulate motor function in which PKCδ expression overlaps with GABAA α4 and δ subunits. To investigate this hypothesis, we performed whole cell voltage clamp recordings on thalamic relay neurons because they express high levels of PKCδ and GABAA α4 and δ subunits and because the thalamus participates in neuronal circuits that control coordinated movement. The input resistances were similar (p < 0.05) in PKCδ+/+ (168.4 ± 8.8 MΩ) and PKCδ−/− (164.1 ± 12.1 MΩ) neurons. In mice, intraperitoneal injection of 1.5 g/kg ethanol yields a peak blood ethanol concentration of 200–240 mg/dl (43–52 mm) within 10 min which falls to ∼150 mg/dl (32 mm) after 60 min (Gentry et al., 1983). Therefore, to conservatively approximate the blood ethanol concentrations achieved during our studies of ethanol-induced ataxia, we examine the effects of 30 mm ethanol on tonic inhibitory currents. Addition of 30 mm ethanol enhanced the tonic GABA current in thalamic relay neurons from wild type mice, but not from PKCδ−/− mice [F (1,16) (genotype) = 0.1, NS; F (1,16) (treatment) = 51.23, p < 0.0001; F (1,16) (genotype × treatment) = 21.49, p = 0.0003] (Fig. 5 A–C). To confirm this result, we examined neurons in another brain region, the hippocampal dentate gyrus, at which we have previously identified ethanol-sensitive tonic currents (Wei et al., 2004; Glykys et al., 2007). As in thalamic neurons, input resistances were similar (p < 0.05) in PKCδ+/+ (151.2 ± 13.3 MΩ) and PKCδ−/− (155.1 ± 15.2 MΩ) dentate gyrus granule cells. Similar to thalamic relay neurons, ethanol enhanced the tonic GABA current in hippocampal dentate gyrus granule cells from PKCδ+/+ mice, but not from PKCδ−/− mice (Fig. 5 D) [F (1,14) (genotype) = 1.35, NS; F (1,14) (treatment) = 30.43, p < 0.0001; F (1,14) (genotype × treatment) = 19.85, p = 0.0005]. This concentration of ethanol did not alter phasic GABA inhibitory postsynaptic currents in thalamic relay neurons (supplemental Fig. 2, supplemental Table 1, available at www.jneurosci.org as supplemental material) or hippocampal neurons (Wei et al., 2004; Glykys et al., 2007). Ethanol enhances tonic inhibitory GABA currents in neurons from PKCδ+/+ but not PKCδ−/− mice. A , Sample tonic current traces recorded in a thalamic relay neuron from a PKCδ+/+ (left) and a PKCδ−/− (right) mouse. These currents were completely blocked by the nonselective GABAA receptor antagonist SR95531 (SR). B , Paired plots of tonic current amplitudes before and after the addition of 30 mm ethanol to the perfusate of thalamic neurons from PKCδ+/+ (left) and PKCδ−/− (right) mice. Filled circles (left) and squares (right) with error bars indicate mean ± SEM current values. C , Mean ± SEM values for tonic current amplitudes in PKCδ+/+ (n = 6) and PKCδ−/− (n = 12) thalamic relay (TR) neurons before (control) and after addition of 30 mm ethanol. D , Tonic current in PKCδ+/+ (n = 9) and PKCδ−/− (n = 7) dentate gyrus granule cell (DGGC) neurons and E , in PKCδ+/+ (n = 5) and PKCδ−/− (n = 9) ML interneurons (ML) before and after 30 mm ethanol. C–E , *p < 0.05 compared with the control condition in PKCδ+/+ neurons by Bonferroni tests. Recently we found that ethanol increases tonic currents in interneurons that reside within the molecular layer (ML) of the dentate gyrus (Glykys et al., 2007). The tonic inhibitory current in these neurons is mediated by GABAA receptors that contain δ subunits and α1 rather than α4 subunits, indicating that δ subunits are critical for ethanol enhancement of the tonic inhibitory current. To determine whether only δ subunits are required for the permissive effect of PKCδ on the response to ethanol, we examined tonic currents in ML interneurons from wild type and PKCδ−/− mice. Again, ethanol enhanced the tonic current (Fig. 5 E) in ML interneurons from wild type mice but not from PKCδ−/− mice [F (1,12) (genotype) = 0.48, NS; F (1,12) (treatment) = 13.39, p = 0.0033; F (1,14) (genotype × treatment) = 7.20, p = 0.0199]. This result indicates that PKCδ modulation of ethanol sensitivity requires the presence of GABAA δ subunits but not of α4 subunits. Because PKCδ appeared necessary for ethanol enhancement of tonic GABA currents, we investigated whether PKCδ acts directly on GABAA receptors that contain δ subunits by using mouse L(tk−) fibroblasts that stably express α4β3δ receptors (Brown et al., 2002). GABA-stimulated currents in these cells have been reported to be insensitive to ethanol at concentrations of 100 mm or less (Borghese et al., 2006). Suspecting that the abundance of PKCδ might be low in α4β3δ-expressing L(tk−) cells, we measured PKCδ levels relative to other cell lines. We found that PKCδ immunoreactivity was >50% lower in L(tk−) cells compared with CHO or HEK-293 cells (Fig. 6 A). We next investigated whether the low abundance of PKCδ might limit the response to ethanol in α4β3δ-expressing L(tk−) cells. To test this hypothesis we increased the abundance of PKCδ in these cells by stably transfecting them with as-PKCδ, which is an ATP analog-sensitive mutant of PKCδ (Allen et al., 2007). The advantage of expressing as-PKCδ instead of native PKCδ is that as-PKCδ can be inhibited with high specificity by compounds that do not inhibit native kinases. The resulting stable cell line expressed PKCδ immunoreactivity that was >2-fold greater than the parent cell line (Fig. 6 B). We then compared the effect of ethanol on GABAA currents in the parent α4β3δ-expressing cell line and the cell line stably transfected with as-PKCδ. In the parent cell line, ethanol increased currents evoked by an EC20 concentration (0.1 μm) of GABA (Fig. 6 C,D) (F (5,60) = 28.16; p < 0.0001). This effect was significant at 3–100 mm ethanol compared with current evoked by GABA alone (p < 0.05 by Dunnett's test). Enhancement of GABA currents by ethanol was significantly greater in as-PKCδ-transfected cells than in the parent cell line (Fig. 6 C,D). Two-way ANOVA revealed main effects of cell line (F (1,97) = 40.77, p < 0.0001) and ethanol concentration (F (5,97) = 26.39, p < 0.0001) with a significant interaction between these factors (F (5,97) = 2.76, p < 0.0226). Based on experience with other ATP analog-sensitive kinase mutants, we predicted that as-PKCδ would be sensitive to analogs of the general kinase inhibitor 4-amino-5-(4-methylphenyl)-7-(t-butyl)pyrazolo[3,4-d]pyrimidine (PP1). In vitro kinase assays with enzyme expressed and purified from COS-7 cells showed that, unlike wild-type PKCδ, as-PKCδ is inhibited by nanomolar concentrations of 1-naphthyl-PP1 (1NaPP1) (Fig. 6 E). In cells expressing as-PKCδ, 30 mm ethanol (Fig. 6 F) reversibly enhanced the GABA current by 47 ± 6% (n = 10), whereas treatment with 10 μm 1NaPP1 significantly reduced enhancement by ethanol to 21 ± 5% (n = 4; p = 0.019 by two-tailed, t test). 1NaPP1 did not alter the EC50 for GABA in as-PKCδ-transfected cells treated with GABA alone (data not shown). These findings demonstrate that PKCδ increases the sensitivity of α4β3δ GABAA receptors to ethanol. In this study we found that PKCδ−/− mice show reduced signs of acute ethanol intoxication compared with wild type littermates. Particularly striking was the resistance of PKCδ−/− mice to ethanol-induced ataxia, suggesting that PKCδ residing in neural systems that regulate coordination is important for the motor-impairing effects of ethanol. This conclusion is supported by the finding that PKCδ is highly expressed in neurons of the ventral thalamus and cerebellar cortex, and in thalamocortical efferents to the cerebral cortex, which all contribute to circuits that control movement. Because GABAA (Lüddens et al., 1990; Fidecka and Langwínski, 1995; Grobin et al., 1998) and NMDA (Khanna et al., 1995; Dar, 2002) receptors are implicated in ethanol-induced ataxia, we examined whether responses to drugs that act at these receptors are altered in PKCδ−/− mice. We found a decrease in the ataxic response to pentobarbital and pregnanolone, suggesting that PKCδ modulates ethanol's effects at GABAA receptors in central motor circuits that control coordination. Our finding that ataxia induced by flunitrazepam was not altered in PKCδ−/− mice suggested that PKCδ selectively modulates GABAA receptors that are benzodiazepine insensitive, the majority of which contain δ subunits and are extrasynaptic. In contrast, we found no difference between PKCδ+/+ and PKCδ−/− mice in their ataxic response to administration of ketamine or MK-801, suggesting that PKCδ does not regulate the effect of ethanol at NMDA receptors. Our analysis of brain expression patterns for PKCδ, and α4, α6 and δ GABAA subunits revealed that PKCδ overlaps with expression of α4 and δ subunits. This overlap was most striking in the thalamus, lesions of which can produce ataxia in humans (Melo et al., 1992). Because recent evidence indicates that GABAA receptors containing α4 and δ subunits mediate tonic inhibition in thalamic relay neurons (Cope et al., 2005; Jia et al., 2005), we investigated whether ethanol enhancement of tonic GABA current was diminished in thalamic relay neurons from PKCδ−/− mice. We found that tonic GABA currents in thalamic relay neurons are increased by ethanol to a much greater extent in cells from wild type mice compared with PKCδ−/− mice. We also examined hippocampal dentate gyrus granule cells because they too exhibit ethanol-sensitive tonic currents that are carried by α4/δ-containing GABAA receptors (Mtchedlishvili and Kapur, 2006). Again, ethanol (30 mm) increased tonic GABA currents in cells from wild type but not from PKCδ−/− mice. Finally, we examined ML interneurons because they express ethanol-sensitive tonic currents mediated by α1/δ- rather than α4/δ-containing GABAA receptors (Glykys et al., 2007). Again, we found that ethanol enhanced the tonic current in neurons from wild type, but not from PKCδ−/− mice. Together, these results indicate that in several populations of neurons, PKCδ is necessary for ethanol enhancement of tonic GABA currents mediated by extrasynaptic receptors that contain GABAA δ subunits. Tonic currents are stimulated by extracellular concentrations of GABA, which are regulated by the activity of GABA transporters on neurons and glia, and by spillover from GABA released at synapses (Farrant and Nusser, 2005). Therefore, PKCδ could alter tonic GABA currents by regulating the ethanol sensitivity of GABAA δ-containing receptors, or by altering GABA transport. Our studies with L(tk−) cells that express α4β3δ receptors, however, showed that overexpression of PKCδ facilitates ethanol enhancement of GABA-stimulated current whereas inhibition of PKCδ diminishes this response. These findings clearly demonstrate that PKCδ regulates the response of δ subunit-containing receptors to ethanol and suggest that PKCδ phosphorylates GABAA receptor δ subunits or another protein that regulates receptor function. Our findings do not eliminate the possibility that PKCδ also regulates GABA transport, but we do not think this could be important for the response of tonic currents to ethanol, because we still observe ethanol enhancement of tonic current in the presence of the GABA transport inhibitor NO-711 (Glykys et al., 2007). Several laboratories report that intoxicating concentrations of ethanol ≤50 mm enhance GABAA currents carried by receptors containing δ subunits (Sundstrom-Poromaa et al., 2002; Wallner et al., 2003; Wei et al., 2004; Jia et al., 2008; Liang et al., 2008). However, some investigators cannot reproduce these findings (Borghese et al., 2006; Yamashita et al., 2006) or find that ethanol modulation of tonic GABA currents is indirect and occurs via stimulation of GABA release rather than by a direct effect on extrasynaptic receptors (Carta et al., 2004). These discrepant results may be due to differences in expression systems, experimental technique, or the age of the animals tested. However, our present results suggest that negative results can also be due to absent or decreased PKCδ activity in some model systems. Our findings add to a growing body of literature that describes the role of PKC in regulating GABA signaling. Two other PKC isozymes, PKCγ and PKCε, modify responses to ethanol in mice through actions at GABAA receptors. 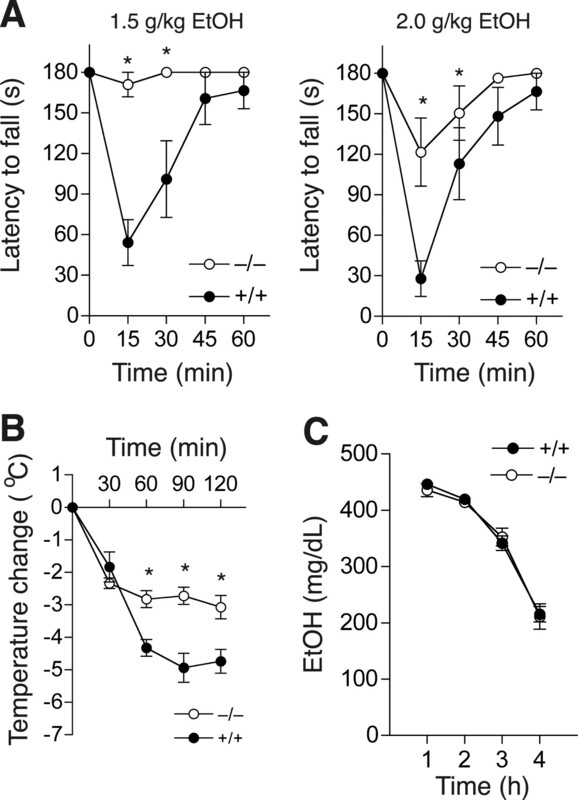 PKCγ−/− mice show reduced ethanol-induced LORR and hypothermia (Harris et al., 1995), whereas PKCε−/− mice show an increased duration of the ethanol-induced LORR (Hodge et al., 1999; Choi et al., 2002). Likewise, ethanol enhancement of GABAA receptor function is reduced in PKCγ−/− mice but increased in PKCε−/− mice (Harris et al., 1995; Hodge et al., 1999; Proctor et al., 2003). We recently found that PKCε regulates the ethanol sensitivity of synaptic GABAA receptors through phosphorylation of GABAA γ2 subunits at S327 (Qi et al., 2007). The mechanism by which PKCγ regulates GABAA sensitivity to ethanol is not yet known. Despite the widespread distribution of γ2 subunits in the brain, PKCε regulation of GABAA receptors is not evident in all brain regions. In the central amygdala, for example, we recently found that ethanol enhances GABA release rather than GABAA receptor function through a process that requires PKCε (Bajo et al., 2008). Thus PKCε can regulate ethanol's effects on GABA systems in different brain regions through modulation of ethanol-induced GABA release or ethanol enhancement of GABAA receptor function. Given the importance of PKCγ and PKCε in regulating ethanol's effects on GABA systems, we considered whether the phenotypes we observed in PKCδ−/− mice are due to altered expression of PKCγ or PKCε. We found that the levels of PKCγ and PKCε immunoreactivity are not different in brain samples from PKCδ−/− and PKCδ+/+ littermates (supplemental Fig. 3, available at www.jneurosci.org as supplemental material). We also measured the abundance of GABAA α4 and δ subunits because tonic GABA currents in PKCδ−/− mice were not enhanced by ethanol. We found their abundance to be similar in cortex, thalamus, cerebellum, and hippocampus of both genotypes (supplemental Fig. 3, available at www.jneurosci.org as supplemental material). Finally, we measured the abundance of other PKC isozymes present in brain and found no differences between the genotypes (supplemental Fig. 3, available at www.jneurosci.org as supplemental material). Therefore, it is unlikely that the present results are due to indirect effects of other PKC isozymes or altered expression of GABAA α4 and δ subunits; instead they reflect an effect of PKCδ on GABAA receptor function. PKCδ−/− mice did not show abnormalities in gross neuroanatomy, brain histology or baseline coordination, strength, or open field activity. The lack of altered brain structure and baseline motor function makes it unlikely that the diminished acute response to ethanol in PKCδ−/− mice is due to major developmental changes resulting from gene deletion. There is a possibility that differences in behavior between hybrid C57BL/6J × 129X1/SvJ wild type and PKCδ−/− mice could be due to effects of 129X1/SvJ alleles surrounding the PKCδ locus that are present in the knock-out but not in the wild type population. However, C57BL/6J and 129X1/SvJ mice do not differ in their ataxic response to volatile anesthetics, and the duration of the LORR induced by 3.5 g/kg ethanol is 25% longer in 129X1/SvJ mice than in C57BL/6J mice (Homanics et al., 1999). In contrast, in PKCδ−/− mice the LORR duration in response to ethanol was decreased compared with wild type littermates. Therefore, the altered behavioral responses we observed in PKCδ−/− mice treated with ethanol and other drugs that modulate GABAA receptors are unlikely due to effects of 129X1/SvJ alleles neighboring the mutated PKCδ locus. In summary, our study provides novel evidence for a PKCδ signal transduction pathway that enhances behavioral responses to intoxicating concentrations of ethanol achieved during social drinking in humans. This regulation occurs at least in part through PKCδ modulation of tonic inhibitory currents carried by extrasynaptic GABA receptors that contain δ subunits. The level of response to acute administration of ethanol has been proposed as a useful endophenotype for genetic studies of alcohol use disorders in humans (Schuckit, 1998; Schuckit et al., 2004). In young adult subjects with a family history of an alcohol use disorder, a low level of response to a three-drink alcohol challenge, as measured by subjective response ratings and ataxia, is associated with increased risk of developing an alcohol use disorder later in life. Our findings in PKCδ−/− mice, therefore, raise the possibility that identification of proteins within neuronal PKCδ signaling pathways that regulate behavioral sensitivity to ethanol and ethanol sensitivity of tonic GABA-stimulated inhibitory currents may reveal candidate genes that contribute to risk of alcohol use disorders in humans. This work was supported by funds provided by the State of California for medical research on alcohol and substance abuse through the University of California at San Francisco, Contract W81XWH-07-1-0078 from the U.S. Department of the Army and National Institutes of Health (NIH) Grant AA013588 to R.O.M., NIH Grant AI44099 to K.M.S., and NIH Grant NS30549 and the Coelho Endowment to I.M. We thank S. Taylor and J. Connolly for maintaining and genotyping the mouse colony. (2007) A semisynthetic epitope for kinase substrates. Nat Methods 4:511–516. (2008) Protein kinase C epsilon mediation of CRF- and ethanol-induced GABA release in central amygdala. Proc Natl Acad Sci U S A 105:8410–8415. (2006) The delta subunit of gamma-aminobutyric acid type A receptors does not confer sensitivity to low concentrations of ethanol. J Pharmacol Exp Ther 316:1360–1368. (2001) Ethanol consumption and behavioral impulsivity are increased in protein kinase Cγ null mutant mice. J Neurosci 21(RC180):1–5. (1999) Decreased ethanol sensitivity and tolerance development in gamma-protein kinase C null mutant mice is dependent on genetic background. Alcohol Clin Exp Res 23:387–397. (2004) Alcohol enhances GABAergic transmission to cerebellar granule cells via an increase in Golgi cell excitability. J Neurosci 24:3746–3751. (2002) Conditional rescue of protein kinase C epsilon regulates ethanol preference and hypnotic sensitivity in adult mice. J Neurosci 22:9905–9911. (2004) Neutrophil protein kinase Cdelta as a mediator of stroke-reperfusion injury. J Clin Invest 114:49–56. (2005) A conceptualization of integrated actions of ethanol contributing to its GABAmimetic profile: a commentary. Neuropsychopharmacology 30:1407–1425. (1997) Mouse cerebellar adenosinergic modulation of ethanol-induced motor incoordination: possible involvement of cAMP. Brain Res 749:263–274. (2002) Mouse cerebellar adenosine-glutamate interactions and modulation of ethanol-induced motor incoordination. Alcohol Clin Exp Res 26:1395–1403. (1995) Ethanol and benzodiazepines. The influence of CGS 8216 on the ethanol-induced hypothermia and motor incoordination in mice and rats. J Physiol Pharmacol 46:429–437. (2007) Magnitude and ethanol sensitivity of tonic GABAA receptor-mediated inhibition in dentate gyrus changes from adolescence to adulthood. J Neurophysiol 97:3806–3811. (1983) Serial determination of plasma ethanol concentrations in mice. Physiol Behav 31:529–532. (1997) Ethanol alters the subcellular localization of delta- and epsilon protein kinase C in NG108–15 cells. Mol Pharmacol 52:554–559. (1998) The role of GABA(A) receptors in the acute and chronic effects of ethanol. Psychopharmacology 139:2–19. (1995) Mutant mice lacking the γ isoform of protein kinase C show decreased behavioral actions of ethanol and altered function of γ-aminobutyrate type A receptors. Proc Natl Acad Sci U S A 92:3658–3662. (2008) Ketamine, but not phencyclidine, selectively modulates cerebellar GABAA receptors containing alpha 6 and delta subunits. J Neurosci 28:5383–5393. (1999) Supersensitivity to allosteric GABAA receptor modulators and alcohol in mice lacking PKCε. Nat Neurosci 2:997–1002. (1999) Pharmacologic and behavioral responses of Inbred C57BL/6J and strain 129/SvJ mouse lines. Pharmacol Biochem Behav 63:21–26. (2005) An extrasynaptic GABAA receptor mediates tonic inhibition in thalamic VB neurons. J Neurophysiol 94:4491–4501. (2008) Ethanol modulates synaptic and extrasynaptic GABAA receptors in the thalamus. J Pharmacol Exp Ther 326:475–482. (1995) D-Cycloserine enhances rapid tolerance to ethanol motor incoordination. Pharmacol Biochem Behav 52:609–614. (2008) Functional consequences of GABAA receptor alpha 4 subunit deletion on synaptic and extrasynaptic currents in mouse dentate granule cells. Alcohol Clin Exp Res 32:19–26. (1990) Cerebellar GABAA receptor selective for a behavioural alcohol antagonist. Nature 346:648–651. (1999) An update on GABAA receptors. Brain Res Brain Res Rev 29:196–217. (1992) Thalamic ataxia. J Neurol 239:331–337. (1991) Chronic ethanol exposure increases levels of protein kinase C δ and ε and protein kinase C-mediated phosphorylation in cultured neural cells. J Biol Chem 266:23428–23432. (2006) High-affinity, slowly desensitizing GABAA receptors mediate tonic inhibition in hippocampal dentate granule cells. Mol Pharmacol 69:564–575. (2000) Reduced operant ethanol self-administration and in vivo mesolimbic dopamine responses to ethanol in PKCε-deficient mice. Eur J Neurosci 12:4131–4140. (1995) The rat nervous system (Academic, San Diego), ed 2..
(2003) Ethanol differentially enhances hippocampal GABAA receptor-mediated responses in protein kinase Cγ (PKCγ) and PKCε null mice. J Pharmacol Exp Ther 305:264–270. (2007) Protein kinase C epsilon regulates GABAA receptor sensitivity to ethanol and benzodiazepines through phosphorylation of gamma 2 subunits. J Biol Chem 282:33052–33063. (2003) Influence of task parameters on rotarod performance and sensitivity to ethanol in mice. Behav Brain Res 141:237–249. (1998) Biological, psychological and environmental predictors of the alcoholism risk: a longitudinal study. J Stud Alcohol 59:485–494. (2004) The search for genes contributing to the low level of response to alcohol: patterns of findings across studies. Alcohol Clin Exp Res 28:1449–1458. (2003) Ethanol enhances alpha 4 beta 3 delta and alpha 6 beta 3 delta gamma-aminobutyric acid type A receptors at low concentrations known to affect humans. Proc Natl Acad Sci U S A 100:15218–15223. (2006) Ethanol modulation of GABAergic transmission: the view from the slice. Pharmacol Ther 111:533–554. (2006) Effects of ethanol on tonic GABA currents in cerebellar granule cells and mammalian cells recombinantly expressing GABA(A) receptors. J Pharmacol Exp Ther 319:431–438.